At the hibachi grill tables, our experienced chefs will cook your food right before your eyes, as well as provide fun and entertainment! The grill tables seat anywhere from one person sharing a table, to a full table of eight, or two tables facing each other (18 people total). We also have a private party room that seats up to 34. Kids love the hibachi grill show! We have a special Childrens menu priced for the whole family! 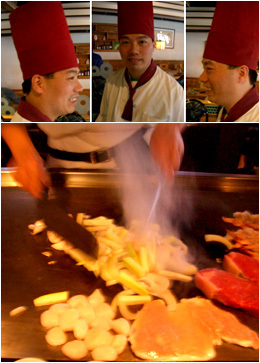 Our Hibachi chefs will prepare you a meal you won't forget!